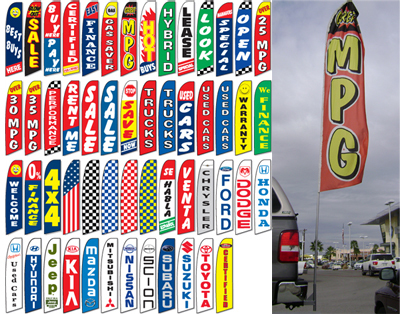 Draw attention with minimal effort with these 15 ft. tall giant flag kits!. Great for the front line or highlighting any vehicle, these flags flutter & flap with a slight breeze. However, unique design allows this flag to "fly" even when there is no wind. Completely portable, a flag can be moved to another vehicle on your lot in minutes. Each Kit includes one flag of your choice, a 4-piece flag pole and an adapter base designed to be used in the trailer hitch of a vehicle. Each flag is 2 feet 5 1/2 inches wide x 11 feet 5 3/4 inches tall and has a sewn sleeve that easily slips over the specially designed flag pole. The 4-piece flag pole is made of anodized aluminum and is slightly over 15 feet tall. The trailer hitch is made of anodized aluminum and is designed to fit into the trailer hitch of a vehicle. Please remember to remove the pole from the trailer hitch before driving the vehicle. Otherwise the Swooper Flag may fall out and cause damage or injury! Order separately and save money! Pick your Swooper Banner Hardware here. Then pick your Banners here.